Most so-called blues guitar teachers don't really know blues guitar inside out; their improvisation methods often are very weak in comparison with guitar teachers in other styles. This comes from the fact that many people believe that the blues is an 'easy' style to play. This believe is so ingrained in today's music education that if you are searching for resources on the topic of blues guitar, all you will find is a half-baked lesson on the minor pentatonic or blues scale. Blues is one of the easiest styles to get into, but one of the hardest styles to master. Many blues guitar teachers will tell you too: “just keep on practicing your improvisation”, without giving you specific instructions on how to practice. This largely comes from the idea that blues is an easy style to learn. You need to know that the guitar is a “young” instrument in comparission with other instruments such as the piano or the violin. This translates into the fact that there aren’t many great methods around for learning the guitar. This is especially true with the topic of blues guitar, because the false believe that blues is an easy style is so ingrained into today’s culture and education. While it is true that learning the basic structure of the blues is fairly easy to get into, the blues is as complex as other music styles (and can get even more complex when you get to the advanced levels of playing blues guitar). If you are reading this, chances are that you are currently at a level in your blues guitar playing where you have the feeling that you can’t look past your current level and you don’t know how to improve. It feels like you can look at where you want to go, but you don’t know how to exactely get there. Nowhere on the internet can you find this information, because general blues guitar information found online is compiled out of a very fragmented view of the whole style (and as we discussed earlier, the believe that playing blues guitar is easy). Yes, the basics of playing blues guitar might be easy, but what if you want to master the instrument? If the answer is ‘NO’, then you came to the right place. Since starting to teach guitar in 2006 I came across hundreds of guitarists that first came to me at exactely the level you are at right now in your blues guitar developement. My guess is, if you are reading this right now that there’s a 95% chance that you are “running in circles” in your guitar playing developement. You are playing the same things over and over again and don’t know how to turn in around. That’s exactely the reason why I wrote the FREE guide on how to break through your blues guitar playing limitations. In this free guide I’ll teach you how to connect chords with scales, so that you know what to play over each chord of a 12 bar blues progression, instead of using the same old minor pentatonic scale over all of the chords, all of the time. This is what is known amongst musicians as “playing over the changes”. Once learned, this will transform your blues solos to melodic pieces of art. Here you will find the free guide: how to solo melodically over blues chords. In this guide we’ll look at everything you need to know to break free from your current blues soloing level, but while you are here reading this article let me give you a great exercise to get you started progressing again. Most blues guitar resources, tabs as well as teachers won’t tell you exactely WHAT to do, WHY it works and HOW to practice. Take for instance the topic of blues guitar improvisation; most guitar teachers will tell you to use the minor and major pentatonic scale to improvise over a basic 12 bar blues progression. But you need more than this in order to effectively learn to improvise. In order to see your current level evolve everytime you touch your guitar, you need guided exercises that tell you exactely what to do. Play over a blues backing track in the key of A and follow the instructions below. 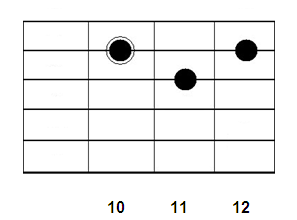 Over the A7 chord use the A major pentatonic scale. Over the D7 chord use the A minor pentatonic scale. 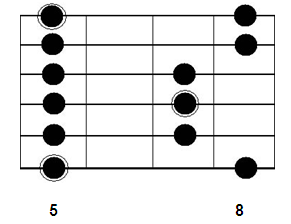 Over the E7 chord use the A major pentatonic scale. Below you’ll find the pentatonic scale patterns you can use. Since you are probably familiar with using the A minor pentatonic scale pattern, I only gave you three notes to work with for the A major pentatonic scale pattern, since these are the notes that are the easiest to sound good. You can bend up the highest note of this three note fragment. Do you hear the difference between the two playing styles? In the last audio track you could hear what most beginners play, while in the first audio track it was noticeable that the soloing was much more melodic (and in this case very reminiscant to BB King’s playing style). Opening up your awareness of ‘when to play which scale’ is essential for your progress on the guitar. You need to be aware of how and when to play the scales that you learn and you need to practice in a constructive way. If you haven’t already I would strongly advice you to download the FREE guide that will help you to break through your blues guitar playing frustrations: Learn To Solo Over Blues Chord Changes.